As the world grapples with global warming and climate change, the top-of-mind question for builders these days is no longer whether they’re building to code, but how much higher above code should they raise the bar for the sake of reducing energy consumption? And does it make sense to embrace a specific standard, such as Energy Star or LEED, or should they just borrow from some of these standards and not worry about certification? And finally, how will all of this impact on sales? Adding to this challenge is the fact that the Ontario Building Code standards, when it comes to energy efficiency, are also about to get a little tighter. 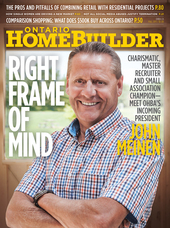 In a prepared statement for Ontario Home Builder magazine, Minister of Municipal Affairs and Housing Ted McMeekin observed that, “When the energy efficiency targets in the 2012 Building Code come into effect in 2017, homes will consume half the energy they would have used had they been built in 2005.” The Minister was also quick to point out these changes have been made collaboratively. “Like all changes to the Building Code, enhancements to energy and water conservation requirements are made in close consultation with our sector partners.” Clearly, they don’t want to be seen as forcing these changes on the industry. Currently, building standards such as GreenHouse Certified Construction are purely voluntary, while others, such as LEED or Energy Star, are mandated in select pockets of the province, including the Toronto waterfront, Markham and East Gwillimbury. But as government regulations evolve, the consensus is that building standards will become more stringent with respect to energy efficiency, not only in 2017 but 2022 and beyond, when the next round of changes are expected. Take, for example, recent developments in California, where, just this past June, the California Energy Commission voted unanimously to approve updated standards that will cut regulated energy use in new homes by 28% compared to houses built under the current code. Known as Title 24, the standards will go into effect on January 1, 2017, and set minimum energy-saving requirements for new buildings and renovations that will reduce energy used for lighting, heating, cooling, ventilation and water heating. The new standards also set the stage for net-zero energy for new homes in the state within five years. So while not coming out and advocating a specific building standard, the state has clearly defined environmental goals with which builders will have to learn to co-exist. Meanwhile in the UK, where buildings account for 43% of carbon emissions, the government has already introduced the Code for Sustainable Homes, which provides a single national standard for the design and construction of sustainable new homes. As an incentive to make existing homes more efficient, the government established a program entitled the Green Deal Home Improvement Fund (due to expire in September of this year). These and other initiatives are tied to the UK’s Carbon Change Act and the goal of reducing carbon emissions by 50% by 2025 and 80% by 2050. Whether in California, the UK or Ontario, the takeaway is there’s a growing trend at all government levels to introduce programs, ranging from voluntary to mandatory, to reduce our carbon footprint and energy consumption which, in turn, will have a direct impact on how new homes are built and existing ones maintained. THE STANDARD OR THE END GOAL? In that pursuit, should the province embrace a specific standard that builders must adhere to? Or does it make more sense to follow California’s model, and establish targets for reducing home energy use and let builders decide how to meet these targets? Chris Magwood, who teaches sustainable building and design at the Peterborough-based Endeavour Centre, favours LEED as the way to minimize the impact homes have on the environment, but feels builders sometimes have to jump through unnecessary hoops before getting certification. The pattern Andrew Oding of Building Knowledge Canada sees is one where municipalities gradually take matters into their own hands and have more leeway. “When LEED was first introduced, the municipalities looked at the shelf (with LEED guidelines) and said, ‘Here, go and build it.’ The problem with that is they didn’t understand the cost implications of a program that basically came out of the U.S. So their mindset (if they had decided on LEED) was, ‘If you’re going to build in our jurisdiction, it needs to be LEED-certified.’ Now a lot of them are doing an about-face. They’re suggesting builders just follow the guidelines.” In other words, more emphasis on building more sustainable homes; less emphasis on the standard itself. In the case of Midhaven, the company has decided to build not just to Energy Star, but GreenHouse standards as well. Described by the likes of McBurney as “Energy Star Plus,” GreenHouse goes a step beyond Energy Star, adding three more sustainability metrics—water, materials and waste and indoor air quality—to its core Energy Star requirement. Can LEED and Passive House co-exist? 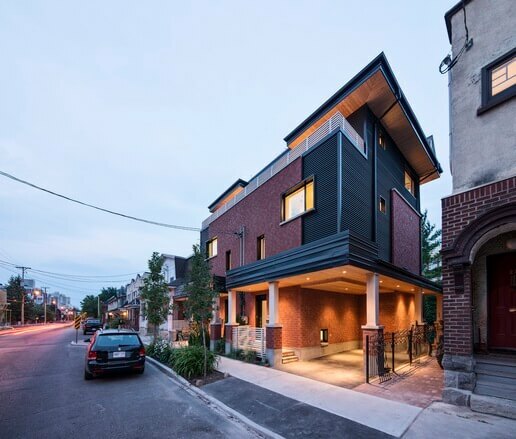 Absolutely, says Ottawa’s VERT plan.design.build owner Chris Straka, whose first home—half of a duplex he designed in the Ottawa neighbourhood of New Edinburgh—was not only Canada’s first certified Passive House, but also LEED Platinum. A similar observation has been made between Energy Star and LEED. In the U.S., for example, LEED requires Energy Star as part of the Existing Building System. Other complementary standards just seeing the light of day include WELL, which deals with such things as air quality and lighting that contribute to the health and well-being of homeowners. Another is GRESB, which looks at existing buildings and their ongoing performance with respect to energy, emissions, water and waste. Like it or not, builders are having to contend with more and more standards, some that are competing and others that tend to go hand in hand. So in choosing a standard to build to in order to help reduce energy consumption, two nagging questions remain: To what extent does building to higher standards matter to consumers? And how will building to a higher standard impact on bottom-line sales?